The Dark Ranger: Welcome Back, Brian! The fans finally demanded his return. Slats pretended to be happy. And best of all, the New York Rangers management buys every single ticket on Stubhub and Ticketmaster Auction available before announcing the date. Schucks! Brian Leetch's jersey No.2 will be retired on January 24, 2008, now to be forever hanging below the historical rafters of Madison Square Garden prior to the Rangers/Atlanta game. He will join Rod Gilbert (7), Eddie Giacomin (1), Mike Richter (35) and Mark Messier (11) as the only Rangers players to have their jersey numbers retired in the history of the franchise. 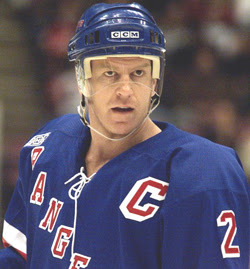 Brian Leetch holds the franchise record with 741 career assists and ranks second in career points (981) and games played (1,129). 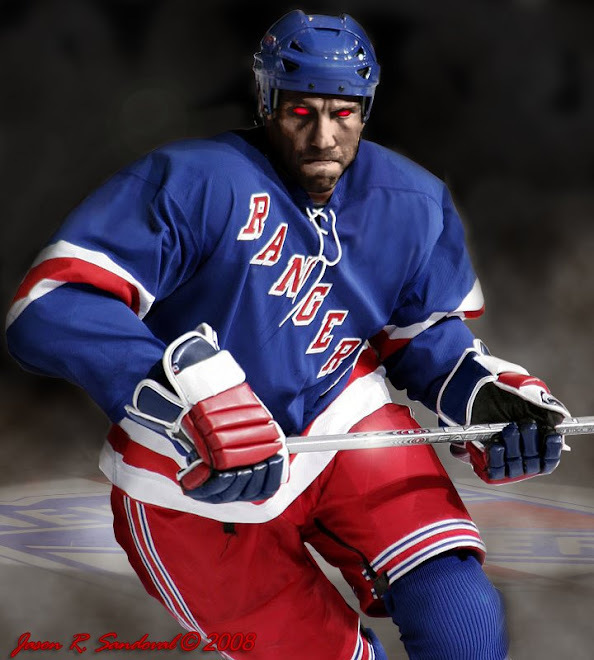 Leetch also holds the Rangers record for goals by a defenseman, with 240. "I appreciate that the New York Rangers have extended the honor of raising my jersey to the Madison Square Garden rafters alongside team icons Rod, Eddie, Mike, and Mark," Leetch said. "New York City, the Garden and Rangers fans hold a special place in my heart and have supplied me with a lifetime of extraordinary memories. This night will be a very special one for me and my family and I look forward to returning to Madison Square Garden and being able to call it home." And of course, look for that eight hundred dollar ticket in the 300 level! We're happy for you Leetchie. We still don't understand why you were shipped away in the first place. Welcome back. We, the fans, love and honor you. I love that MSG announces the game and states " no single tickets for this game". pretty convenient, but i must admit i am more interested in the atlanta rematch than the family speeches. there are 2 atlanta games in that same week. Most hockey fanatics are in it for the history & nostalgia - the "I was there!" and understand that fans want to celebrate their victor - a great player! A great player who in the later years was not treated like one of our own, so in some ways this one means more than the Messier tribute last season.